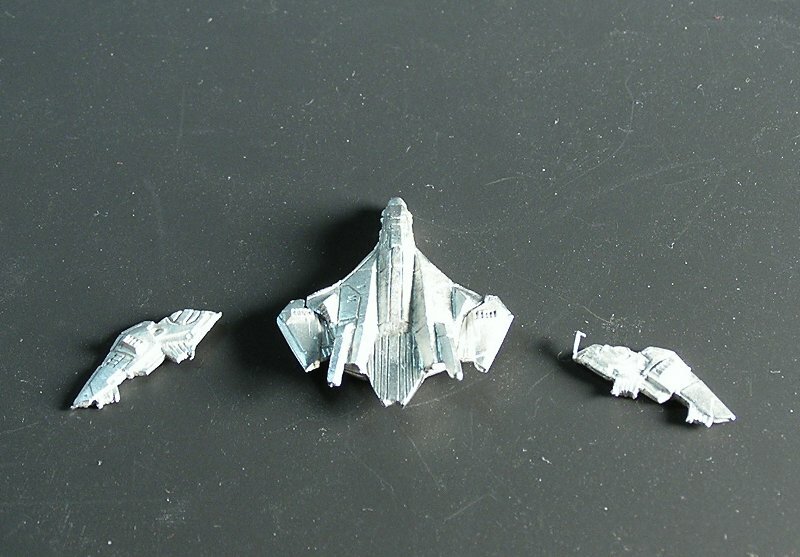 I looked up some of the artwork to figure out what was going on, and quickly realized that all three are variable geometry (or "swing wing") fighters, and that the sculptor had included enough pieces to assemble each fighter with the wings in either the extended or retracted positions. 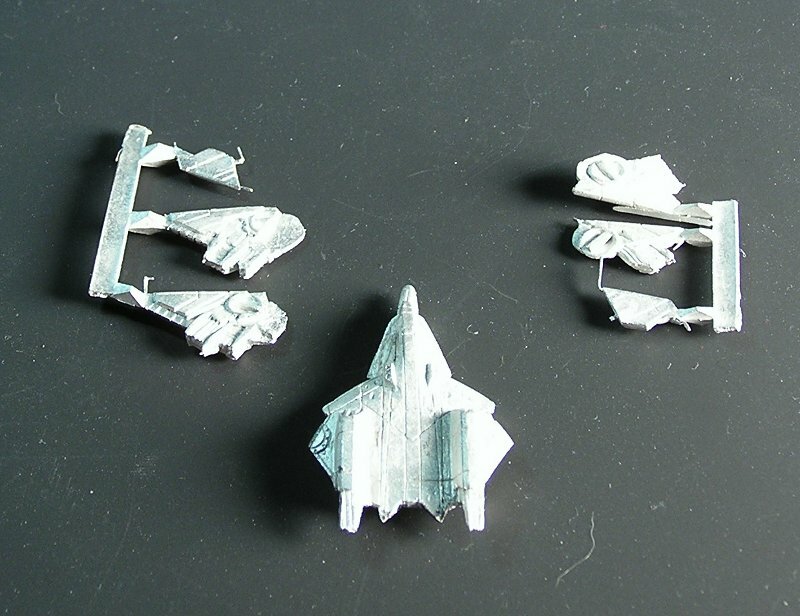 According to the entry in Technical Readout 3075, the Spectral fighters have their wings extended for atmospheric flight and retracted for space combat. 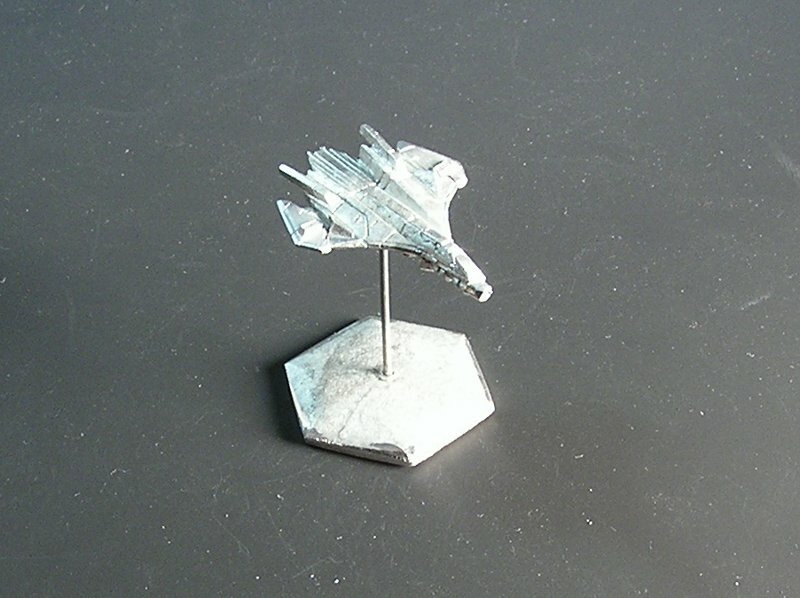 This is not to be confused with fighters whose wings sweep back for better performance during supersonic flight, though the concept is similar. 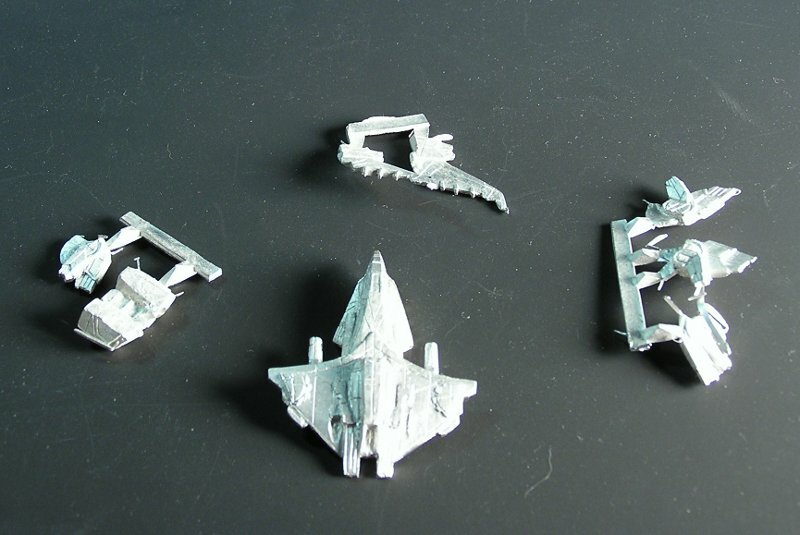 I have taken some pictures to make it easier for fans to assemble these minis. 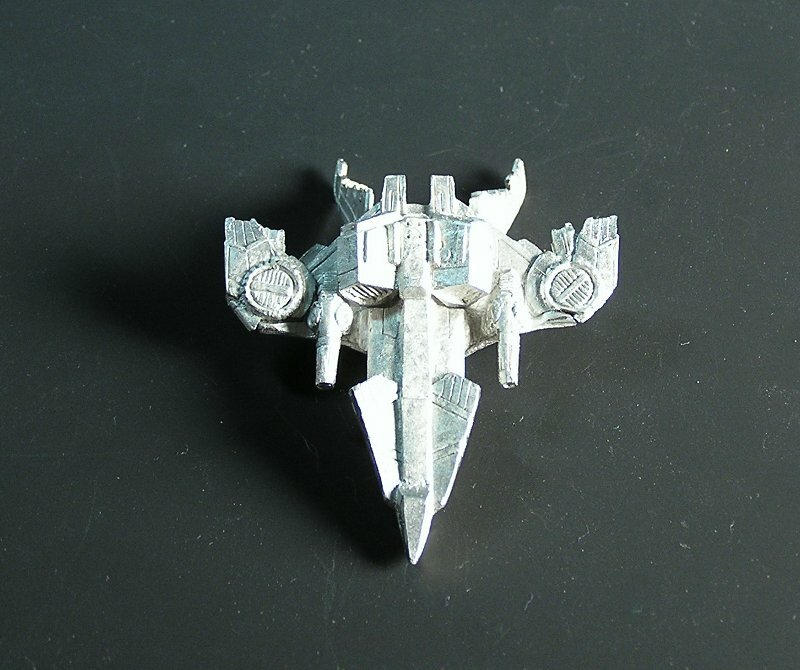 The first thing you need to know about the Shade is that unlike the other two WOB Omnifighters, the Shade does not have separate pieces for vertical tails. 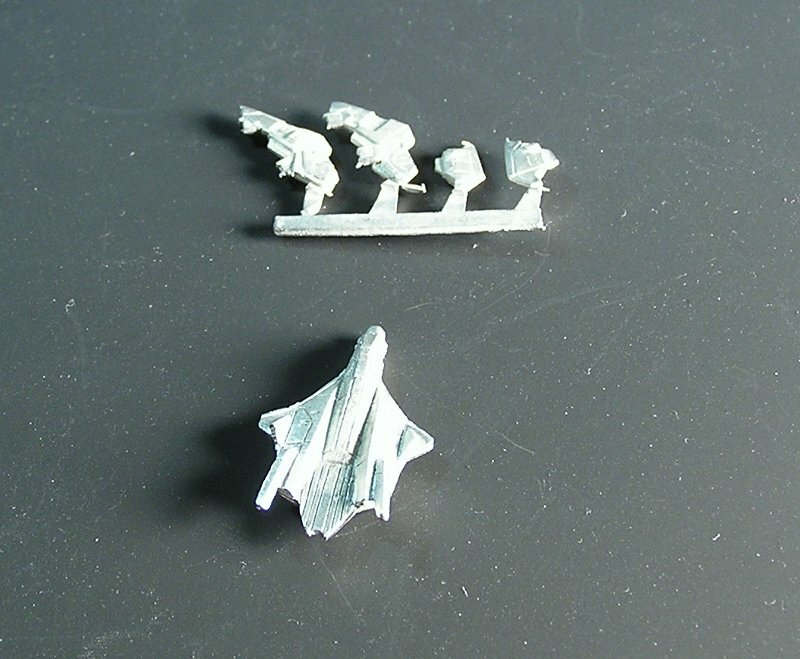 The parts list includes: the fuselage, left wing (extended or retracted), and right wing (extended or retracted) as seen below. I decided to make mine with the wings retracted. I attached them, and then set the other set of wings nearby to demonstrate how they would have attached. I spent some time reviewing the artwork for both wing configurations to make sure I had them right, so hopefully this picture will help to remove any ambiguity. 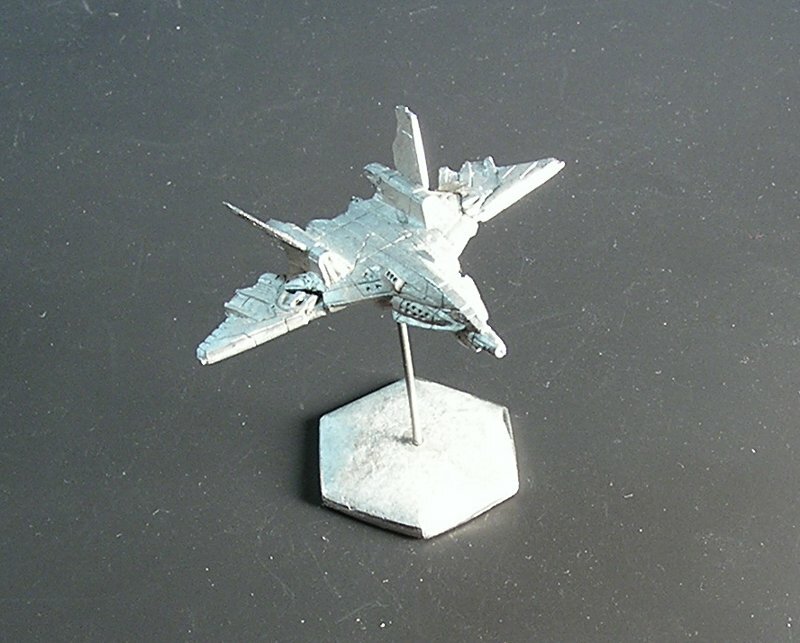 Here is a photo of the fully assembled miniature. Of the three, this one was the easiest to build; the other two have more pieces to worry about. Next is the Rusalka. This mini is a lot like the Shade, except it also has twin vertical tails. All of the parts are shown below. 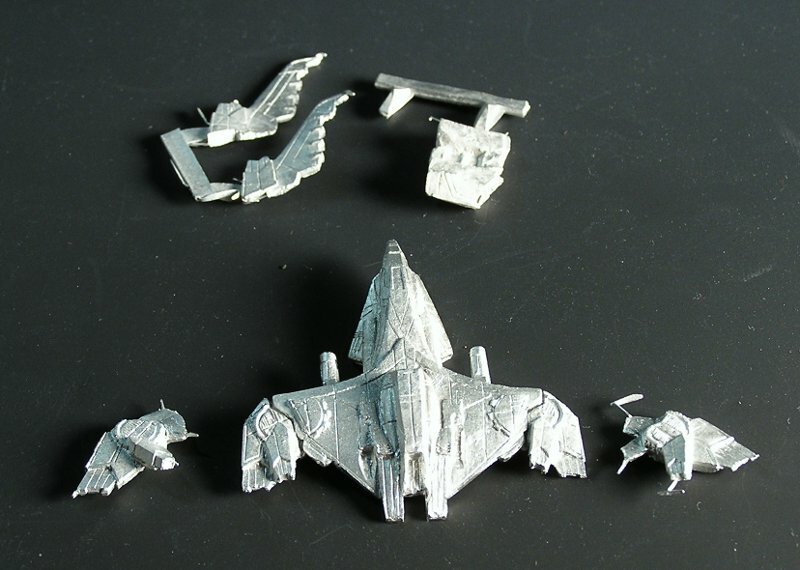 Again, the mini has parts to make the wings either extended or retracted. I chose to make mine with extended wings. After some careful inspection, I figured out how to attach them. In the picture, I've oriented the retracted ones as they would be positioned if you were going to use those instead. Next, I added the vertical tails. They appear to be symmetrical, so as long as you don't put them on backwards (i.e., swept forward). They were pretty easy to attach. Finally, we have the Striga. 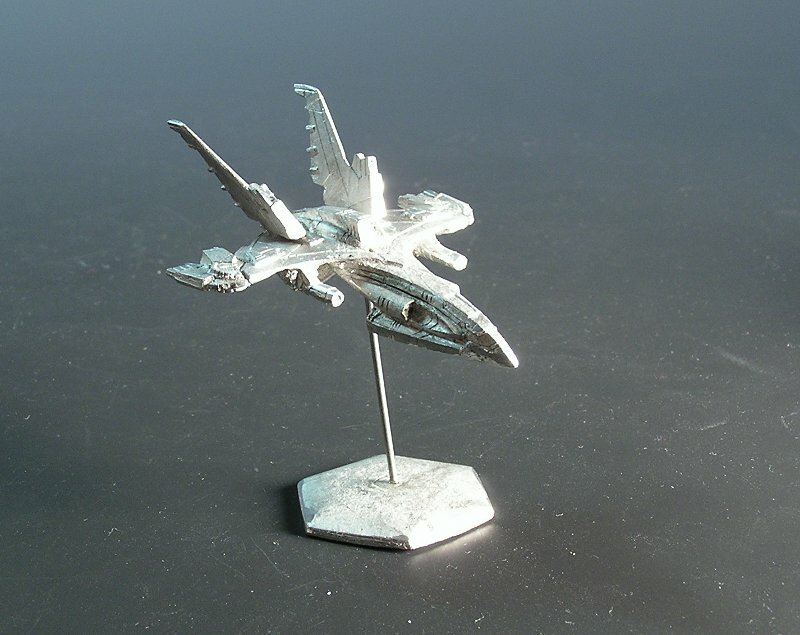 The third mini in the series, this one adds the additional complexity of a second fuselage piece. All of the parts are shown below. 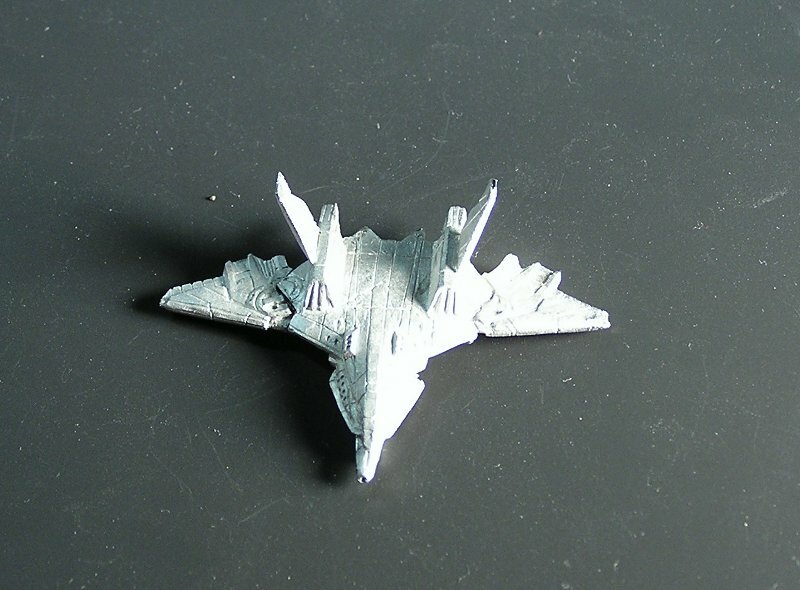 As with the Shade and Rusalka, there are two versions of each wing. I chose to go with the retracted wings on this one, and oriented the extended ones to show how they would have attached. Next are the vertical tails. 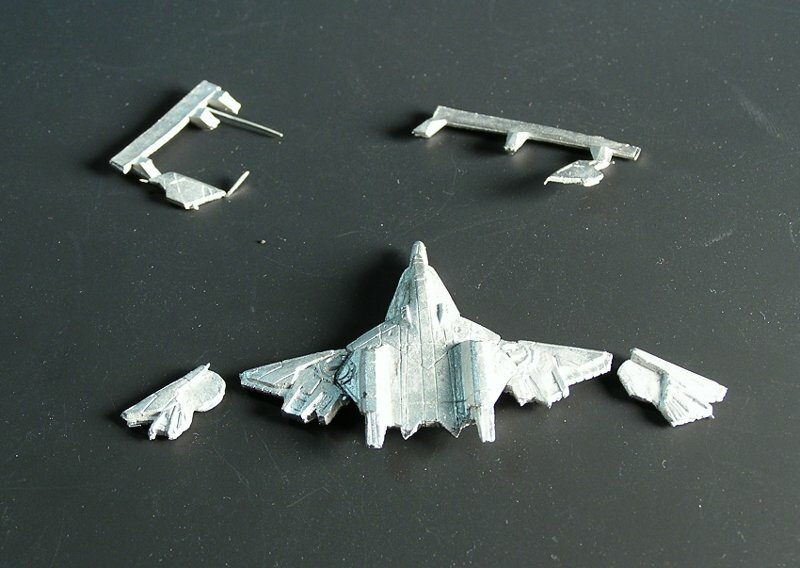 These are fairly large for an aerospace fighter, and there are slots for them to fit into. Since the fuselage is pretty thin at this point, it would be tough to pin these for extra strength, so use a healthy dab of glue. It's hard to get a sense of the bottom fuselage piece when you look at it on its own. Just remember that the grills are the intakes and they go in front. That makes it easier to see where this piece fits onto the upper fuselage. 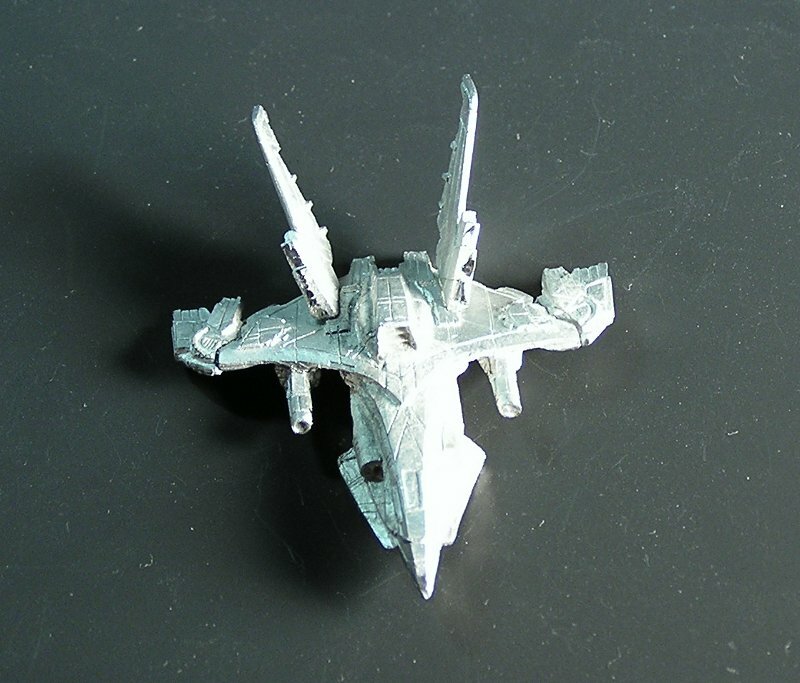 Finally, here is a picture of the fully assembled Striga, the third and final Spectral Omnifighter mini.